We’re delighted to announce that you can now use our ELEX Dynamic Pricing and Discounts for WooCommerce plugin with the popular WooCommerce Product Table plugin. This means that you can improve your store layouts by listing products in a table view while getting all the extra benefits of dynamic pricing and volume discounts. Used together, the two plugins can make your store much more appealing to customers and really increase your sales. Why do I need WooCommerce Product Table? WooCommerce Product Table is the flagship plugin from Barn2 Media, a WordPress agency in the UK. With over 1,300 users, it’s a popular way to get more sales by displaying products in an easy-to-find layout. Quite simply, the plugin takes the products already on your WordPress website and lists them in a tabular format. For most stores, this is a big improvement on the standard WooCommerce layout. More products appear per page, so customers don’t waste time scrolling through multiple pages of information. 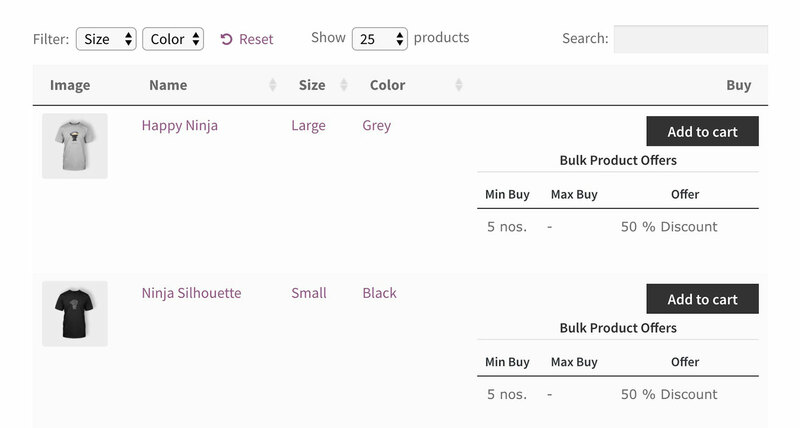 You can show extra data directly on the product listing page, such as the product description, attributes, dimensions, and even custom fields and taxonomies. Customers can see all this information at a glance, select the products they want, choose their variation options, and add everything to the cart in a single click. By speeding up the buying process, WooCommerce Product Table can make a big difference to your conversion rates. Why do I need ELEX Dynamic Pricing and Discounts for WooCommerce? The ELEX Dynamic Pricing and Discounts for WooCommerce helps to grow your sales by providing price-based incentives for customers to buy from you. As you know, everyone is motivated by price. With a bit of thought, you can create dynamic discounts that will appeal to your customers’ on a psychological level. It’s a great way to inspire them to buy more. Date-based discounts – Automatically set a WooCommerce sale price for dates when customers are looking for a deal, e.g. Black Friday/Cyber Monday weekend or Boxing Day. Category-based discounts – This is a great way to set the optimum pricing for different types of products depending on their category. For example, if you need to create a WooCommerce wholesale store, then you can create a separate category for your wholesale products. Once you’ve done that, you can automatically add a % discount to that category. Role-based discounts – Another option is to automatically set the pricing based on the logged in user role. For example, logged in users with a ‘Wholesale’ role can automatically get a set discount off the recommended retail price. Customer-specific pricing – If you want to set different discount levels for specific customers, then you can do this. When the customer is logged into their account, they will receive the correct discount just for them. List the available discounts in a table – The dynamic pricing plugin has a neat option to list the available discounts in a table. This is a clever way of motivating your customers to spend more. It tells them that if they add more products to their cart, they can get an even better deal! Quantity, weight or value based discounts – Offer bulk discounts based on the quantity, weight or total price of the order. The plugin has lots of options for getting this working in a way that’s best for you. For example, you can offer discounts on individual products or the entire order. Choice of flat, percentage and fixed price discount rules – Research the psychology of pricing and decide whether your customers will respond best to different types of discount. All this is available in the premium version of ELEX Dynamic Pricing and Discounts for WooCommerce. The free version is more limited but still has plenty of useful features that work with WooCommerce Product Table. How will dynamic pricing work with my product tables? WooCommerce Product Table automatically integrates with ELEX Dynamic Pricing and Discounts for WooCommerce. You don’t need to do any special config. Simply install both plugins and set them up using the documentation provided. Here’s a link to the WooCommerce Product Table knowledge base, and here’s one for the ELEX Dynamic Pricing and Discounts documentation. Your products will be listed in a product table layout. When someone adds a product to their cart, the correct discounted price will automatically be added to the cart. Customers can get their dynamic discounts either by clicking the add to cart links in the product table, or by clicking through to the single product page where they can view their discounts and buy. Can I show the available discounts in the WooCommerce product table? Set ‘Display Prices Table on Product Page’ to ‘Yes’. Set ‘Position of Pricing Table on Product Page’ to ‘Before Add to Cart Button’ or ‘After Add to Cart Button’. When you create your product tables, don’t add a ‘Price’ column because this will just show the standard price, and not the discounted prices. Instead, include an ‘Add to Cart’ column. Depending on your settings for displaying the prices table (see Step 1), the available discounts will appear above or below the add to cart buttons in the WooCommerce table. We hope this integration is useful for anyone who is already using the ELEX Dynamic Pricing and Discounts for WooCommerce plugin, or looking for dynamic pricing options for their website. It works beautifully with WooCommerce Product Table and allows both plugins to be used in more diverse ways than they can on their own. We’d love to know how you use product tables with dynamic pricing on your own WordPress website. Please let us know in the comments below!